If history has taught us anything, it’s that those who show up and speak up are the ones who make great things happen. 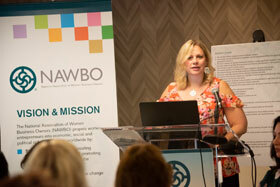 This year’s NAWBO Advocacy Day—attended by more than 100 women business owners compared to 25 when it was first held four years ago—was a great example of what it means to “power your voice” as a woman business owner dedicated to making positive change. 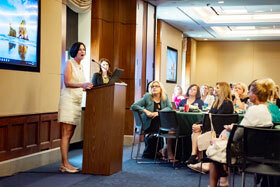 Held on June 19th, NAWBO members from across the nation came together in Washington, DC. 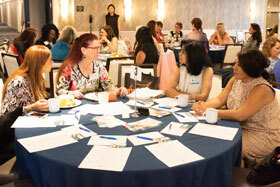 to hear from and engage with speakers and legislative movers and shakers to represent the voice of women business owners today. Attendees began the day by visiting the U.S. Capitol, and went on to meet with the U.S. Senate Small Business Committee Staff, members of Congress and the Presidential Administration on Capitol Hill. 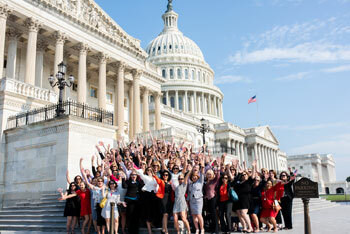 They heard from inspiring speakers, including staff from the office of Democratic Leader Nancy Pelosi’s office, Caroline Harris, vice president Tax Policy and Economic Development at the U.S. Chamber of Commerce and Kathy McShane, assistant U.S. small business administrator at the Office of Women’s Business Ownership. 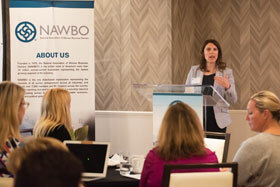 NAWBO attendees were even able to personally connect with members of Congress and their staff during a special “meet your members” event.